Spring Fix-Ups: Creative Ways to light Your Patio | 41 Lumber - Serving Iron Mountain and the U.P. As the temperatures rise, your living space can finally extend to the outdoors once again. As you venture outside and begin your spring cleanup, in addition to taking care of what winter had left behind and making whatever repairs are necessary to your patio, why not take the time to consider different outdoor lighting options? Not only can this extend your use of the patio into the evening hours, a properly lit patio can be a safe and attractive alternative to the typical outdoor light usually attached to the side of the house. How you light your patio depends on how you use your patio. Are you interested in just lighting a safe passage from point A to point B? Is there a focal point that you wish to accentuate? Do you have a patio cover and wish to create a more intimate ambience, similar to an indoor space? All three are easily accomplished using different lighting techniques. 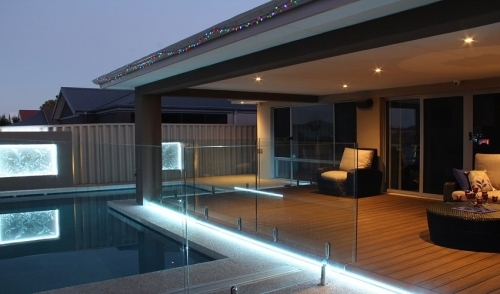 Path lighting can be used along your patio to ensure people can clearly see the way. Path lighting is especially helpful near steps. These can be either solar or electrical lights along the sides, or recessed into the stone or brick work. The technique of spread lighting uses low level, evenly dispersed illumination over key points of the pathway. These can be installed in trees or adjacent structures along the patio. String lighting is ideal for accenting railings and trees along your patio. They deliver a gentle glow and provide a festive air. String lighting can be used all year long --not just for Christmas. They come in solar and LED options, making them a sound economical choice that can bring your patio to life once the sun goes down. For a rustic look, consider traditional lanterns. They can be hung along pathways or positioned as centerpieces. Either way, you will create a charming, old world atmosphere in your own backyard. Choose from authentic gas lamps, kerosene, or modern versions that utilize bulbs instead. Don’t discount that old standby… firelight. Nothing sets the mood more than flickering, gentle flames. In addition to your overhead lighting, consider a few strategically placed sconces where you can let candles add to the mood. For a bit of fun, placing glow-in-the-dark decor around your patio and flower bed can bring a little bit of magic to your outdoor space. For additional creative ideas, look to your favorite eateries once the sun goes down. Many offer outdoor seating, so take a good look at what they used to create a relaxing atmosphere. Well-placed bistro style string lights can define your space as well as give that outdoor café feel to your patio.